In the first version you could paint with “lighten” or “darken” mode. We always liked to watch how the colors are mixing, burning and creating the new blended colors. However, sometimes you would prefer to paint with the same color you choose. In the new version we will all be satisfied and happy, because the “normal” mode is coming. Actually, the “normal” mode is the the most used painting mode in every other painting application, but it was a serious achievement to get this mode together with flame renderer, because the math principles are very different. Nevertheless we did it, and successfully added it to the new version. Mixing the colors is the first step before starting each painting. 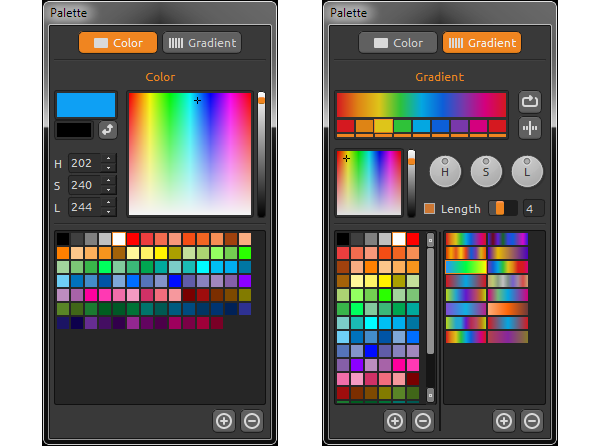 With our new Palette Selector this will be a breeze. Choosing colors will be a lot more simpler than in the first version, you also can easily adjust, add or remove colors from your color preset library. We also redesigned Gradient tool. 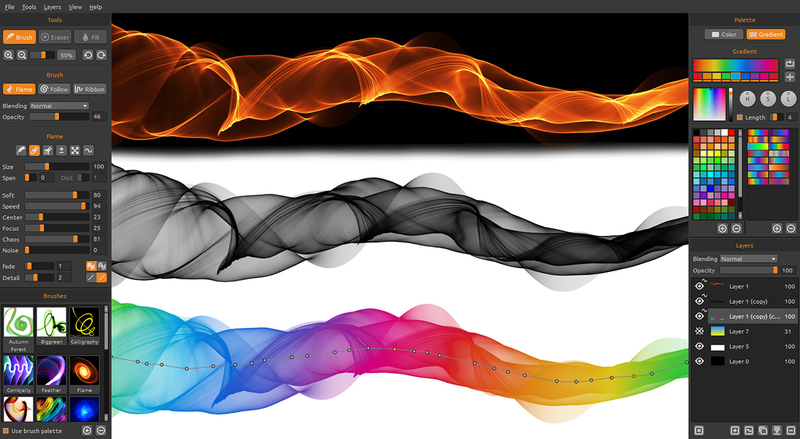 It is a lot easier and faster to create new gradients than before. You simply pick and modify colors from the preset library, or globally change hue, saturation and lightness for all colors in the gradient. Then you can save it back to library for later use. We believe you will like these new features, and in the next session we would like to compare the difference between the Personal and Professional version.